Montana’s 2018 big game hunting season opened on October 20th with a light harvest under sunny skies and unseasonably warm temperatures in west-central Montana. Montana Fish, Wildlife and Parks (FWP) check stations near Bonner and Darby recorded the lowest combined totals of harvested elk and deer for opening weekend since 1999. The Anaconda station is not open this year; instead two chronic wasting disease (CWD) surveillance stations are in place in the nearby Flint Creek Valley. “The warm weather certainly played a role in the lack of hunter success, and we’ll expect that to change as the season moves along,” said Scott Eggeman, FWP wildlife biologist in the Blackfoot area. High temps reached the 60s and 70s over the weekend. The harvest of 25 elk at the Bonner check station was above its five-year average of 20 for opening weekend, but the harvest of 50 elk at the Bitterroot Valley’s check station near Darby was lower than its five-year average of 62. The Bonner check station reported 39 white-tailed deer, down from its five-year average of 63 for opening weekend, while the white-tailed deer harvest of seven at Darby was the same as last year, but down from its five-year average of 14. Mule deer harvests of 10 checked at Bonner and five at Darby were on par for average opening harvests. Hunter check stations sample a small portion of the effort and harvests across the region, but they do represent trends over time, according to Mike Thompson, FWP Region 2 Wildlife Manager. “Check stations are an important part of monitoring harvest trends and recording information on wildlife age, health and other observations from the field,” Thompson said. 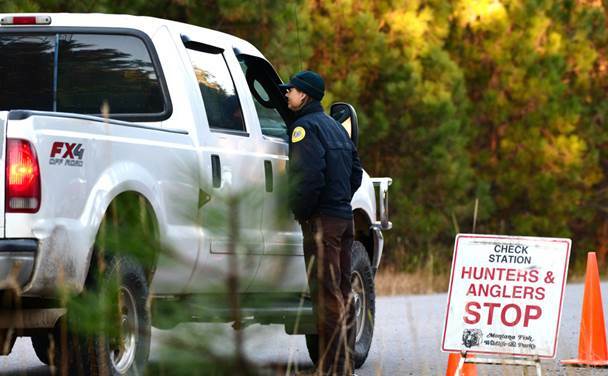 Hunters must stop at all check stations that they pass, even if they have not harvested any animals. The general rifle season for deer and elk runs through Sunday, Nov. 25.